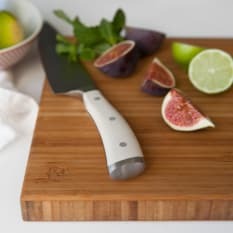 From carving up a roast chicken to dicing an onion, investing in a proper knife will change the way you feel about cooking and make you a better cook. Whether you're starting out or building up your collection, we've got you covered from chef's knives to mezzalunas and back. The chef's knife, or cook's knife, is the most important knife in the kitchen — it's your work knife. 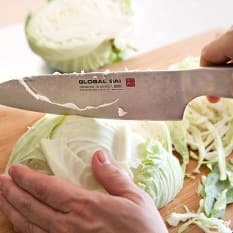 They're ideal for chopping, dicing and mincing everything, from proteins to vegetables. 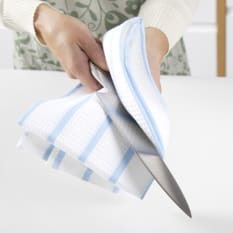 The paring knife’s small, narrow blade tapers to a point at the tip, which makes it perfect to trim, slice, and peel small produce such as garlic and herbs. The serrated edge of the bread knife guides the blade through tough crust, without compressing the soft inside and leaves minimal crumbs.